From the moment that you see it across the fields, you know that St Mary is something special. At first the silhouette perhaps, or a stain of gold that resolves as you approach into a solid little Norman church. The thatched roof is charming, and set against is a small square tower, also crowned in thatch. There is a stubborn timelessness about it, a silent witness to long centuries. There isnt really a village, and St Mary sits lonely in the fields. At night it is floodlit and floats above the darkness. On winter days, the low light catches its honeyed walls across ploughed furrows. In summer, the entrancing trees gather, a setting for a diadem. This has always been a special place for me. I was captivated at an early stage of my life in Suffolk. And it was while visiting here in late 1998 that I first got the idea for this website, and decided to do it. Thornham Parva was the first entry. In common with most of the very earliest entries, it wasnt terribly good  I hadnt even taken any photographs. But that was an excuse to return again and again, and when this website was featured on BBC Televisions Songs of Praise in 2000, the interview was recorded here at St Mary. They filmed me cycling the narrow lanes round about in the sub-zero temperatures of late-January; if anything, it was even colder inside the church, and my breath clouded the air as I became quite possibly the first person ever to say the Hail Mary on prime-time television. Thornham Parva, of course, isnt just special to me. It is one of the most remarkable churches in East Anglia, a treasure house, an aesthetic pleasure, a delight. It is a perfect antidote to the triumphalism of nearby Eye, an intensely rural collision of historical circumstances that have left us a moving and coherent document of our Suffolk past. When Cautleys revising editors came this way in 1975 they found the church in a bit of a state, and even feared for its future. That it is now the perfect model of a well-cared-for English parish church is a tribute to the energy and enthusiasm of the tiny handful of local parishioners who have nursed it back to health. The church gets a fair number of visitors, because its fame has spread far and wide. As an example, I popped in here a few years back with my daughter. She was about five years old at the time, and without me noticing she signed the visitors book with our full address (not something I would normally advise). Within a fortnight, I had received a nice postcard from Israel, from a user of this site who had spotted the entry in the visitors book. It is not surprising that the church does get visitors from all over the world, because St Mary is worth seeing, and worth going to see. In particular, it has, not one, but two astonishing survivals. If they were in the Victoria and Albert Museum you would willingly travel to London to see them, and pay handsomely for doing so. And yet here they are, in the fields that punctuate the Thornham woods, in a church which is open every day. You step directly down into the church from a small Norman doorway in the north side. A gorgeous 18th century gallery curves above you  theres no other like it in Suffolk. It was made tiny, to fit in this tiny space. Unfortunately, the stairway is now kept locked so, unless you contact a churchwarden first, you cant see the clever way the carpenter engineered benches that open and close over the gangway to allow more seating space. The gallery is a reminder that St Mary was the church of the ordinary people; The neighbpouring village is Thorenham Magna, and the local big house Thornham Hall, the home of the Hennikers, is beside the church at Thornham Magna. 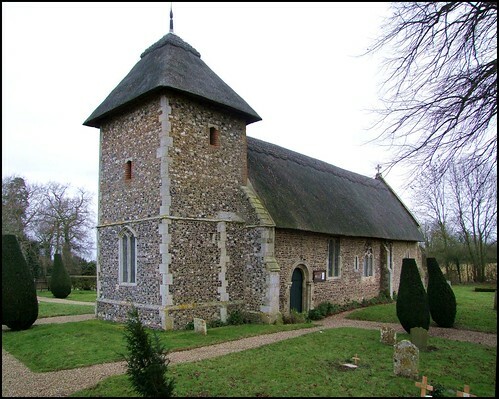 However, it was at the big house, or more accurately in one of its barns, that in the 1920s was found and donated to this church the remarkable Thornham retable. It was restored in the early years of this century, and returned to St Mary, now standing proud behind alarmed glass. The retable is only part of a much larger altarpiece that probably once stood in the Priory at Thetford in Norfolk. The rest of the piece can be found in the Musee de Cluny in Paris. The retable was rescued and hidden after the Anglican Reformation destroyed the priory, along with so many of Englands treasures. Perhaps it was taken by recusant Catholics to use in their devotions. More likely, it was simply rescued because it is beautiful. From left to right, the figures are St Dominic (Thetford was a Dominican Priory); St Catherine; St John the Baptist; St Paul; a rood group of the Blessed Virgin, Christ and St John; St Peter; St Edmund; St Margaret; St Peter Martyr (another Dominican). The retable dates from the height of the Decorated period, in the decades before the Black Death. They are probably the most alive, and lively, medieval figures in Suffolk; St Catherine in particular looks as if she is stepping through an archway from dancing in a garden. As if the retable were not enough, the walls of St Mary are lined with some of Suffolks most fascinating wall-paintings. They rank with those at Wissington, and date broadly from the early years of the 14th century, and are in two ranges; on the south wall is the story of the early years of Christ. On the north wall is the martyrdom of St Edmund. This is amazingly rare; fragments survive not far off at Troston, but there is only one other sequence of the martyrdom surviving in the whole of the Kingdom. Both sequences are organised chronologically from right to left. This may seem awkward, but effectively they start in the south west corner of the church and continue anti-clockwise around to the north-west corner. Unfortunately, the paintings on the west wall are now lost to us, behind the gallery. On the south side, it is reasonable to assume that the very first painting, on the south side of the west wall, was an Annunciation  the angel appearing to Mary. This is lost. A fragment of the next frame survives, just poking up above the south end of the gallery. This is the Visitation, and we see Mary embracing her cousin Elizabeth. The Visitation was a very important part of medieval devotions, because of the way it balances and connects with the Assumption; the Assumption of the Blessed Virgin, on August 15th, was one of the most significant feast days in the English medieval calendar, and the Assumption was probably the dedication of the majority of Suffolk churches. The other images in the sequence are clearer. We see the angel appearing to the shepherds, and then Christ sits on his mothers lap while the shepherds adore him. Note the way we have lost the adoring figures because of the later punching through of a window. Similarly, the next frame, the Presentation in the temple, has also suffered from fenestration. We often talk about Victorian vandalism of medieval churches, but here is a prime example of destruction caused by 15th century restoration. What was the point of this sequence? A lot of nonsense is talked about wallpaintings and stained glass being the poor mans Bible for peasants who couldnt read. This analysis suggests that they were destroyed during the 16th century Anglican Reformation because they were no longer needed. In fact, the Anglicans destroyed them because they were Catholic devotional tools  the wall paintings on the south side here form a rosary sequence, pictures for meditation while saying prayers with the aid of rosary beads. Often this was done during Mass. If the Anglicans were to turn our churches into congregational preaching houses, the wall paintings had to go. Intriguingly, the wall paintings here may have been whitewashed even before there were theological reasons for doing so. Most of the windows that punch through the wall paintings date from the 15th century, not the 16th. Could there have been a general redecoration at this time? Whichever, they were whitewashed, to be rediscovered in a kinder, gentler age. When the ranges here were uncovered by the Victorians, the south range was easily recognisable. But the north range wasnt. For many years, it was thought to represent the martyrdom of St Catherine, because of the large wheel above the way you came in. It was only at the time the paintings were restored in the late 1970s that it became clear that here was something much more exciting. The sequence begins at the eastern end of the range, and you can click on the images below to enlarge them. We see Edmund fleeing the Viking attack on a town, possibly Rendlesham, home of the Wuffings, the East Anglian royal family. The actual martyrdom is lost because of another of those great windows, but we next see Edmunds decapitated head being put back on the body by a group of monks. Then, the body is carried off to its shrine at Bedricsworth (soon to become St Edmundsbury) while the wolf that found and guarded the head looks on. The final image on the north wall shows the wheel of a bullock cart crossing a bridge  delightfully, the bridge is represented by the arch of the doorway. This depicts an event that happened some time after. St Edmunds body (by now sanctified and canonised) is being taken away to escape a later assault by Vikings. It approaches a bridge that is simply too narrow to allow the cart to pass. Miraculously, the cart crosses the bridge, and the Vikings are foiled. Perhaps there was a final image on the north side of the west wall. Perhaps it showed the fabulous shrine at Bury itself. We can never be sure. Although it is sad that we have lost so much of both sequences because of later alterations, it has to be said that the walls of this church are beautiful. The late medieval windows, which include some excellent 20th century glass by Lawrence Whistler, the paraffin lamps, the memorials to churchwardens, all add rather than detract. The screen is tiny and over-restored, but you can still see the sawn-off ends of the rood beam and the floor of the rood loft. Standing in the rood screen, the retable behind you for a moment, the full beauty of the gallery can be seen, and above it a circular Saxon window. You can step outside and see how it is hidden by the tower. The tower itself is surprisingly late; we are told that in the 1480s it was the work of Richard Cutting and John Mason. Apparently, they were sued for defective workmanship, but it still appears to be standing. The graveyard is an interesting one. As well as several significant musicians, it includes the grave of the great 20th century architect Basil Spence, designer of Coventry Cathedral, the Kensington and Chelsea barracks in London, and Britains best university campus, the University of Sussex - to name but three. Ironically, his 1980s gravestone appears to be wearing away. One hopes he used better materials for his buildings.